Touched by a camp or retreat experience at Pecometh? Looking for an affordable way to say thanks? 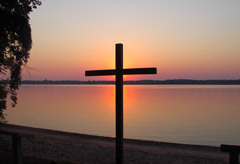 If you believe in the ministry of PECOMETH we invite you to give thanks by enrolling in THE GODFREY LEGACY SOCIETY by naming “Pecometh Camp and Retreat Ministries” in your will, or as a primary beneficiary in your retirement account or insurance plan. Here are some ways you can give more than you may be able right now. Consider the percentage bequest! If you are a person of modest income this will allow you to take care of the needs of your family and loved ones, but still make a significant contribution to this life-changing ministry. For someone whose total remaining assets are $200,000, a 5% bequest would leave $190,000 for your children and/or other causes. This allows you to keep your assets during your lifetime in case you need them, while still allowing you to give what may be the biggest single gift you are ever able to give. For more information about planned giving opportunities and The Godfrey Society contact Rev. Dave Buchanan, Director of Development, 302-382-5359, or dave@pecometh.org. The Godfrey Legacy Society is named after George and Carolyn Godfrey, whose lives have become synonymous with the history of Pecometh. Carolyn came as a camper for the first EVER week of summer camp in 1946. George started coming in 1948. They met while working on summer staff. Like many who came later, George answered the call to ministry at a Galilean Service in the Outdoor Chapel, and later was appointed the first Camp and Youth Director for the Peninsula Conference. They have persisted in numerous ways to support Pecometh throughout the years through volunteer service, church support, and board participation.